REE Mechanical, Inc. - Blog - REE Mechanical, Inc. Most of the air quality news we hear about in California usually involves the outdoor smog from automobiles and manufacturing plants, or the seasonal pollen count conversations that pop up come spring. But air quality isn’t a problem exclusive to the outdoors, or to just a single time of year. Indoor air quality (IAQ) is often much worse than the outdoor air—up to five times worse in fact, according to the Environmental Protection Agency! So what are the pitfalls of IAQ in the fall and winter? As the temperatures start to drop through the fall, there’s no doubt you and your family are spending more time indoors. This means closed windows, closed doors, and you’re likely switching your thermostat from “cool” to “heat.” With a closed home, proper ventilation is much harder to achieve (especially without a whole house fan), so the air in your home is circulating any pollutants with no means of escape. What’s more is that as you rely on your furnace to keep your home warm, the combustion it requires could be releasing harmful byproducts into your living space. The most prominent byproduct of combustion appliances is carbon monoxide, which can be harmful even in low levels. Allergies Aren’t Just for Spring! Sure, spring might be the most popular time for plants to bloom, but that doesn’t mean it’s the only time! Winter blooming plants can cause seasonal allergies as they enter your home; an increase in dust mites and mold growth is common as you close up your home for the colder temperatures; and all of these irritants are recirculating your home with nowhere to go. Your family and home also send pollutants and harmful particles into the air. Off-gassing occurs when the materials that make up your home (wood, drywall, paint etc) slowly release particles into the air. And as you use cleaning supplies, soaps and detergents, and other harmful chemicals in your home, those particles are also circulating in the air you breathe if they are not properly filtered and ventilated. ​So what can you do to boost your home’s IAQ before it gives you a headache? Simply being aware of your home’s IAQ is the first step towards breathing healthier home air. If you are more conscious of the chemicals you bring into your home, you can cut down on the particles you introduce. But you can also be proactive about actively removing those particles from your home. The air filters in your air conditioner and furnace should be checked each month and replaced as necessary (per manufacturer specifications). This is the first line of defense when it comes to catching the pollutants that send your IAQ plummeting. Your ductwork could also have leaks and faults that are allowing more dust to enter the air in your home. Any mechanical system that removes air from the inside if your home is classified as home ventilation. This can include your bathroom fans and oven range hood, but these are usually not very efficient for proper ventilation. Whole house fans are installed in the attic and replace the air in your home 15-20 times per hour. They also come with an added summer bonus of dropping the temperatures in your house without the use of your air conditioner! If you are looking to keep your IAQ free from as many harmful particles as possible, a whole house air purifier will kill 99.9% of all harmful microbes using ionization and UV light. These systems are installed in-line with your heating and cooling systems to remove anything that enters your home. REE proudly installs the REME HALO® In-duct air purifier, which operates by recreating nature’s process of purifying the air, and will purify every inch of cubic air that your central systems can reach. If you want to keep your Temecula home a sanctuary from the outdoor smog and allergens, talk to the local experts at REE Mechanical. We take pride in our training, customer service, and expertise in the Temecula climate. Each individual home doesn’t just deserve a custom approach, it requires it. Breathe better and breathe easier in your home today! Don’t let the quality of the air you breathe drop with the temperatures. Boost your home’s IAQ with REE Mechanical! Give us a call at 1 (855) 636-8216 or contact us today! Keeping a Temecula home comfortable when it’s hot outside has traditionally meant one thing—cranking up the air conditioner. And sure, an air conditioner may provide cool air, but at what cost? Traditional home cooling systems are costly to operate and do not provide the necessary ventilation that your home requires to maintain a healthy indoor air quality (IAQ). This is where whole house fans come in. A whole house fan replaces the recycled, stale air in your home with cooler and fresher, healthier air for much less than it costs to run an air conditioner—50% to 90% less. When you get home from a long day of work and your home is piping hot, your first inclination might be to turn on your air conditioner. But with a whole house fan installed in your attic, the hot air that has built up in your home while you are away is pulled up into the attic and vented out. This allows fresh and cool air to circulate through your home via your open windows. This is a significantly more efficient process than turning on your air conditioner. An air conditioner would take significantly longer to cool down the air in your home and is a “closed loop” system. This means it won’t ventilate your home or introduce fresh, clean air for you and your family to breathe. So, not only does an air conditioner take longer to cool your home, but it also costs more to operate. A whole house fan only costs pennies on the hour! At REE Mechanical, when we looked for a whole house fan to provide to our customers for their home cooling and IAQ needs, we wanted to install the quietest and most efficient fans on the market. We didn’t have to look far with Temecula-made QuietCool fans. What Makes A QuietCool fan different? Temecula based QuietCool whole house fans save an estimated 50% to 90% on air conditioning related cooling costs. Plus, they are whisper quiet. These efficient and powerful fans will replace the air in your home up to 20 times per hour, removing dust, contaminants, pet dander, and more from your home. You can run these fans for hours, even overnight so that you can take full advantage of the cool evening air! Staying on top of the ventilation in your home is essential to breathing healthy air. A whole house fan provides the proper ventilation your home needs, all year round. It removes harmful contaminants and volatile organic compounds and keeps your humidity under control. A less humid home is at a much lower risk of mold growth. Plus, with a cooler home temperature you can rely less on your air conditioner. This will extend the life of your AC unit and reduce your risk of an unexpected breakdown. With a Temecula made whole house fan professionally installed by the Temecula home comfort experts, there is no question you are getting the best in local expertise and industry leading technology. Support the local economy two-fold when you choose a QuietCool whole house fan installed by the home performance specialists at REE Mechanical to keep your home cool and healthy, all year round. Explore the energy efficient cooling power of a QuietCool whole house fan, installed by Temecula’s premiere home performance experts at REE Mechanical. Request an estimate today — call 1 (855) 636-8216 or get in touch. The ductwork in your home is like the circulatory system of your HVAC appliances. They are what keep your home comfortable year round by delivering carefully conditioned air from your air conditioner or furnace to each area of your home. Air ducts are often out of sight and out of mind, which is just how you want them; but these all-too-common problems with ductwork could be costing you in increased energy bills and decreased home comfort. A common mistake when designing and installing an HVAC system is undersizing the ductwork needed. There are a lot of factors to be taken into account when it comes to sizing the ductwork in your home, like the heating and cooling loads of each room in the house, and the type of HVAC system your home uses. Improper duct sizing makes your heating and cooling system work much harder than it needs to to keep your home comfortable, leading to higher energy bills and an increased risk of an expensive HVAC breakdown. The U.S. Department of Energy has estimated that leaky ducts are the top energy waster for homes in America. Of all the conditioned are that your HVAC system pushes through its ductwork, only 60% of that air is making it into your living space when you have cracks and gaps where your ductwork was not properly installed. These holes in your ductwork allow expensive conditioned air to escape into your attic and crawlspace, as well as harmful dust particles and other contaminants to infiltrate and circulate throughout your home. Professional design and repair of your ductwork addresses any damage done to your ductwork during its installation, as well as any of the other ductwork hurdles that are specific to your home heating and cooling needs. If your Temecula, CA home has been increasingly difficult to keep cool this summer, or if you are worried that the dropping temperatures of fall will have you shivering from room to room, it’s time to call the experts. REE Mechanical has been diagnosing ductwork problems for Temecula homeowners since 1987 – and we’ve seen it all. If your ducts are in need of repair or even a full redesign, we’ve got you covered with the best in materials and customer service. So stay comfortable in your home year round, and quit wasting your money month after month on your high energy bills with the experts at REE Mechanical! Wondering why your HVAC system isn’t keeping your whole home comfortable? It’s time to call the pros. Get a hold of the experts at REE Mechanical by calling 1 (855) 636-8216 or contact us today. The smoke is beginning to clear, and another California wildfire season is nearly behind us. But as fall approaches and the smoky haze dissipates, are you finding that you’re still coughing and sneezing in your own house? Do you get frequent headaches, or even find yourself having to clean up the dust around your home more often? Wildfires can do real damage to your indoor air quality (IAQ), even after the last of the flames have been put out. Your home may have been a safe distance from the flames — but the smoke in the air is much harder to avoid. As wildfires burn, they send large amounts of contaminants into the atmosphere, plummeting the quality of the outdoor air. When inhaled into your lungs and introduced into your bloodstream, these tiny particles can increase your risk of developing asthma, aggravate your allergy-like symptoms, and induce headaches. Unfortunately this isn’t just an “outside the home” problem. These microscopic contaminants are settling in your home as well. As outside air enters your home via open windows and doors, your air filter does its best to remove any harmful particles that are floating in the air. This is traditionally what keeps your indoor air quality at a safe level. But air filters can’t catch everything, and that means those contaminants are entering your ductwork. Air gaps and cracks in your home’s construction also allow the smoky air to infiltrate your home, which is in turn circulated through your ductwork. After the California wildfire season has subsided, those particles in your home have built-up in your ducts and continue to circulate, plummeting your IAQ long after the flames are put out. This is where duct cleaning becomes vital if you want to breathe easy in your home. A thorough duct cleaning with the specialists at REE Mechanical removes all of the dust, allergens, and smoke particles from your ductwork and cooling system. Our duct cleaning process begins with inspecting your ductwork (including the furnace or AC unit filters), looking for ductwork design flaws or poor connections, and inspecting for damaged or poorly sealed ductwork. This process informs us of any additional duct solutions you may benefit from, like a whole house air purification system or a duct repair/redesign to fix holes and cracks that are letting dust and allergens be sucked into your ductwork. Once your ducts are free from dust, bacteria, and other harmful particles, you will begin to notice a reduction in those allergy-like symptoms, respiratory issues, and headaches. When it comes to solving the indoor air quality issues in your Southern California home, trust the reliable specialists at REE Mechanical to keep you and your family breathing easy all year round. We train our employees to the highest educational standard, because the 100% satisfaction of our customers in Los Angeles, Orange, Riverside, San Bernardino, and San Diego counties is our only goal. If this wildfire season has done a number on your ductwork, don’t wait another day. Give us a call to schedule your duct cleaning today! It’s time to breathe fresh air in your home again. Put wildfire season behind you and schedule your duct cleaning today! Call 1 (855) 636-8216 or contact us to learn more. For 30 years now, REE mechanical has been answering Temecula’s questions about air conditioning. We know you want your home to be as comfortable as possible, and we want the same thing. We often get asked the same questions time and time again; so before you go spending too much of your precious time Googling your air conditioning queries, here are the answers to the top five questions we get asked. Your air conditioner should be cooling your home quietly and efficiently. So, any time it is making too much noise, it is likely time to have a look “under the hood,” even if it’s just for a minor repair. To get to the bottom of what may be going on, you need to know what kind of sound your ac unit is making. Are you hearing any of these? Something could be loose inside of your system, or it could be a simple issue with your thermostat. Both are relatively easy fixes but will definitely require professional help. This may be a little more serious. This is a clear sign that something is loose and knocking around. It could be in the rod/crankshaft, an unbalanced blower, or it could be in the compressor. But what you really need to know is that this problem is definitely not going away anytime soon. It could lead to even more serious issues if not addressed. No, it’s not your stomach. A gurgling noise usually means there is a leak in your refrigerant. A hissing sound means it has turned into a big leak. This is a “turn the AC off and call a professional ASAP” type of issue. When you’re hearing a squealing noise, it means an indoor or outdoor fan or blower wheel are in need of some attention or replacement. Again, these things won’t fix themselves, and you should have an expert take a look at it. This can be for a number of reasons: your air filter could be in need of replacement, you have leaky ductwork, your refrigerant is in need of re-pressurization, or you have a tripped circuit breaker. Keeping up with regular maintenance on your air conditioner is the best way to prevent this from happening. You wouldn’t go a full year without having your car looked at or at least the oil changed would you? We recommend scheduling professional maintenance on your system at least once a year. 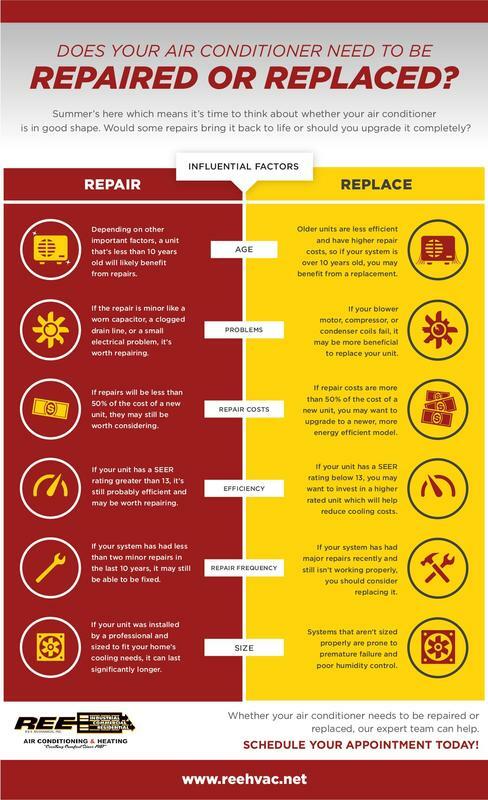 Proper maintenance has proven to prevent nearly 80% of all AC repair calls. This is one of the most important things you can do to ensure the lifespan of your home comfort system. This is the easiest answer of the bunch: You call the Southern California HVAC experts at REE Mechanical! Our professional factory-trained technicians will diagnose and repair your home’s cooling, no matter what manufacturer or type. We want to get you and your family comfortable again in your Temecula home — and save you money by preventing costly breakdowns and ever-climbing monthly energy bills. So, why wait to get your home comfort system running as efficiently as it can? Not sure what’s wrong with your home’s air conditioner? The trained experts at REE Mechanical are here to help. Contact Us or call 1 (855) 636-8216 to schedule your AC repair today. Does your Air Conditioner Need to be Repaired or Replaced? Summer's here which means it's time to think about whether your air conditioner is in good shape. Would some repairs bring it back to life or should you upgrade it completely? Depending on other important factors, a unit that’s less than 10 years old will likely benefit from repairs. Older units are less efficient and have higher repair costs, so if your system is over 10 years old, you may benefit from a replacement. If the repair is minor like a worn capacitor, a clogged drain line, or a small electrical problem, it’s worth repairing. If your blower motor, compressor, or condenser coils fail, it may be more beneficial to replace your unit. If repairs will be less than 50% of the cost of a new unit, they may still be worth considering. If repair costs are more than 50% of the cost of a new unit, you may want to upgrade to a newer, more energy efficient model. If your unit has a SEER rating greater than 13, it’s still probably efficient and may be worth repairing. If your unit has a SEER rating below 13, you may want to invest in a higher rated unit which will help reduce cooling costs. If your system has had less than two minor repairs in the last 10 years, it may still be able to be fixed. If your system has had major repairs recently and still isn’t working properly, you should consider replacing it. If your unit was installed by a professional and sized to fit your home’s cooling needs, it can last significantly longer. Systems that aren’t sized properly are prone to premature failure and poor humidity control. Whether your air conditioner needs to be repaired or replaced, our expert team can help. Air conditioning season has arrived in the Temecula area, so it’s a good idea to be sure your AC is in good working order. The best way prepare for the warmest months of the year is to sign up for a maintenance plan that ensures the continued performance of your air conditioning system, your family’s comfort at home, and energy savings. We all know that preventive care is more effective and less expensive than waiting for trouble, whether it’s for your health, your car, or your HVAC system. But because it’s easy to put maintenance on the back burner until something goes wrong, it bears repeating just the same. Here are four reasons why it pays to schedule preventive maintenance for your cooling system. ​Regular cleaning and tune-ups are the best way to ensure you’re getting the most out of your AC unit. Maintenance keeps your AC unit performing efficiently and using less energy for lower utility bills. A clean system is healthier for you and your family. If your unit becomes clogged with dirt and dust, it will distribute particulates back into your living space, impairing your indoor air quality, or IAQ. Poor IAQ is unhealthy as it can cause allergies and exacerbate immune system disorders. Murphy’s Law says your AC will break down during the year’s hottest stretch of weather. This doesn’t have to happen! Most emergency repair calls and the costs that come with them can be avoided with regular maintenance. Regular maintenance allows your AC unit to work more efficiently, putting less burden on its parts and prolonging its life overall. A maintenance contract helps you uphold the manufacturer’s warranty and put off system replacement for as long as possible to get the most from your investment. Don’t wait for a breakdown before you call a professional. Be proactive with a worry-free AC maintenance plan. REE Mechanical offers a variety of different plans which include a thorough 66-point check-up and 24-hour emergency service with no overtime charges, so you’re sure to find one to fit your needs. Is It Time for an AC Upgrade? If your air conditioning unit is an inefficient older model or simply near the end of its life, you may want to look into an air conditioning upgrade, such as a new high-efficiency heat pump, a ductless mini-split, or a VRF (variable refrigerant flow) system. These systems offer fuel-efficient home heating as well as cooling and allow for customized zoning options. Navigating all the choices available can be confusing, but the experts at REE Mechanical can help you find the right system and correct size for your home. Save energy, improve your comfort and indoor air quality and lower your utility bills with a maintenance plan or an air conditioning upgrade. Make sure you’re not caught in the heat this summer. Contact us or call 1 (855) 636-8216 to schedule AC maintenance or enroll in a maintenance plan! Allergy season is in full swing. Fortunately, you can keep your allergies at bay when you’re home. The first step is to improve your indoor air quality. with frequent air filter changes. which reduces concentrations of indoor air pollutants and allergens. Another effective solution is whole-house air purification. This will purify your home’s air so you can breathe easy. Finally, duct cleaning can clear remnants of indoor air pollutants. Stop aggravating your allergy symptoms at home! Start with help from REE Mechanical. Get in touch with our team today! What would happen if the heating or cooling system at your business suddenly broke down? Productivity would likely suffer, and that, in turn, would result in some major profit losses. Then there is the cost of repairing your commercial HVAC system to worry about. Though they may not be the first things on your mind, well functioning heating and cooling systems are essential for keeping things running smoothly at your business. Regular HVAC maintenance can go a long way in protecting your HVAC equipment and reducing your risk of a sudden breakdown. Scheduling regular HVAC service isn’t just a good idea; it’s really the only way to get the most from your commercial HVAC equipment. With quarterly visits for your heating and cooling systems each year, you can keep equipment running at peak efficiency — which, in turn, keeps your energy bills down from month to month. HVAC maintenance also allows you to catch minor issues before they become more serious issues, reducing your risk of a breakdown. With well functioning HVAC systems, you’ll have peace of mind in knowing that you’re keeping expenses down while maintaining high productivity. Plus, your HVAC equipment will last longer, giving you more from your HVAC investment. HVAC maintenance is simple when you have a commercial heating and cooling expert at your side. By enrolling into one our customizable maintenance plans, you’ll get an comprehensive annual tune-up for both your heating and cooling systems. Each tune-up will include an in-depth safety inspection, thorough cleaning, tightening of all electrical connections, and more to ensure peak performance year-round. Whether you manage an office building, restaurant, retail mall, or municipal building here in Southern California, REE Mechanical is here to help you get the most from your HVAC systems with professional maintenance. As a full-service commercial HVAC company, we also provide fast repairs and expert installation of all types of equipment for efficient heating and cooling in commercial spaces. Our services extend not only to traditional heating and air conditioning system but also to chillers, VRF systems, and more. Maintain a healthy and comfortable business environment. Call (855) 636-8216 or contact us today to schedule heating or cooling system service!